Eight rarely seen notebooks created by Jean-Michel Basquiat between 1980 and 1987 that have never before been presented to the public form the core of a new exhibition, Basquiat: The Unknown Notebooks, on view at the Brooklyn Museum from April 3 through August 23, 2015. The exhibition features 160 unbound notebook pages, filled with the artist’s handwritten texts and sketches, along with thirty related paintings, drawings, and mixed-media works drawn from private collections and the artist’s estate. Born in Brooklyn in 1960, Basquiat had a prolific career, producing some 600 paintings, 1,500 drawings, and a small group of sculptures and mixed-media work before his untimely death in 1988 at the age of twenty-seven. His life and meteoric rise to fame has become legendary, both within the art world and in popular culture-mythologized in films and referenced by hip-hop and rap artists. The child of a Haitian father and Puerto Rican mother, Basquiat was fluent in French, Spanish, and English. With his mother he made frequent visits to New York City’s museums, including the Brooklyn Museum, where he was a Junior Member. A self-taught artist, Basquiat first came to public attention in the late 1970s for the aphorisms he spray-painted around lower Manhattan under the pseudonym SAMO©. In 1978 Basquiat left Brooklyn for good and moved to Manhattan, living on the streets and with friends and selling handmade postcards. Basquiat exhibited his art publicly for the first time in 1980 at the Times Square Show, and his career as a studio artist and international celebrity followed a rapid trajectory from that point onward. In developing a visual language aimed at undermining social hierarchies and rules, Basquiat took inspiration from comics, children’s drawings, advertising, and Pop art, from Aztec, African, Caribbean, Greek, and Roman culture, and from everyday life. In his large-scale works he engaged in an exploration of culture and society, combining historical and popular themes. His notebooks demonstrate how he began to develop these artistic strategies. 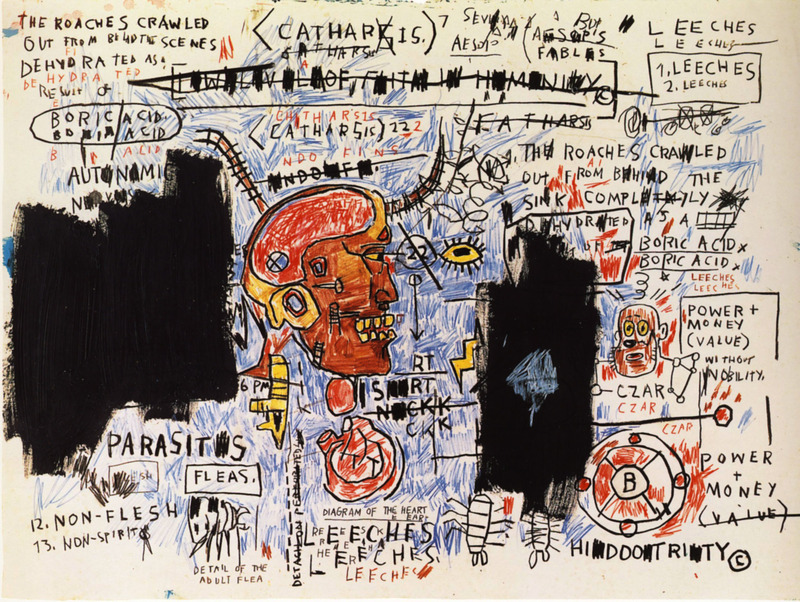 Language was an early medium for Basquiat, and words are an integral part of the notebooks and the large-scale figurative paintings for which he is best known. Handwritten texts run throughout his diverse production, blurring the lines between writing and drawing, and between drawing and painting. While the total number of notebooks created by Basquiat remains unknown, the notebooks presented in this exhibition reflect the originality of Basquiat’s thinking and the diversity of his subjects. The eight notebooks in the exhibition and several other works come from the collection of Larry Warsh, a New York-based publisher and early collector of Basquiat works, who previously served as a member of the Basquiat authentication committee. Basquiat followed a specific format for his notebook texts, which were written primarily in black ink in block capital lettering similar to that of his street graffiti. Writing only on the right-hand pages, leaving the reverse sides blank, he used color sparingly in the notebooks, with a few exceptions. Early sketches of subjects that recur in later works, such as tepees, skeletal faces, and crowns, appear in the earliest notebooks from 1980-81. The notebook writings range from extended narrative poems and wordplay to observations of New York’s street life, along with lists of celebrities and incidental notes from the artist’s personal life. As in his paintings, fragments of found texts appear throughout the notebooks, incorporating street signage, news stories, and references from literature and the Old Testament. Other pages reflect Basquiat’s overriding interest in highlighting racial discrimination and acknowledging the important contributions of African Americans and other people of color, as well as his interests in music, world history, and popular culture. The exhibition, which will tour to venues to be announced, has been organized for the Brooklyn Museum by Dieter Buchhart, independent curator and Basquiat scholar, and Tricia Laughlin Bloom, Associate Curator of Exhibitions, Brooklyn Museum. The exhibition will be accompanied by a fully illustrated catalogue published by the Brooklyn Museum and Skira Rizzoli. The volume includes essays by Dieter Buchhart; Henry Louis Gates, Jr., Alphonse Fletcher University Professor and Director of the W. E. B. Du Bois Institute for African and African American Research at Harvard University; Franklin Sirmans, Department Head and Curator of Contemporary Art at the Los Angeles County Museum and a co-curator of the Brooklyn Museum‘s acclaimed 2005 exhibition Basquiat; and Christopher Stackhouse, a Brooklyn-based writer and visual artist.